Almost all applications on Red Pitaya are made of two parts. We call them frontend and backend. You can see them on the picture below. Everything that works in your browser and you can see it this is the frontend. This is the part that can visualise data on screen or change some parameters to adjust settings inside your applications. Other things that are connected with hardware on Red Pitaya’s board are calles backend. You can’t see this application directly but this is the most important part of application which can help you to control hardware. Backend has ability to work with Digital PINS, control LEDs on board, load FPGA image, work with fast inputs and outputs and lots of other things. Frontend and backend requires communication within each other. This is mostly done with Red Pitaya network APIs which are technically based on extended websocket connection. When you’re writing your application you don’t need to think about communication and data transfer. Our network APIs take care about data transfer. All you need is simply follow of some rules. You can read about this rules in How to add a button to control LED. In general backend is your Red Pitaya. But when we’re talking about your application backend is controller of your application. Controller is shared linux library with .so extension. It operates with specific memebers which are called Parameters and Signals. First of them are needed for handling state of important variables of your app. Another one are needed for collecting number of data inside one container. You can use lots of them at the same time. None of them are necessary, so if you don’t need singlas in your application you may not use them. 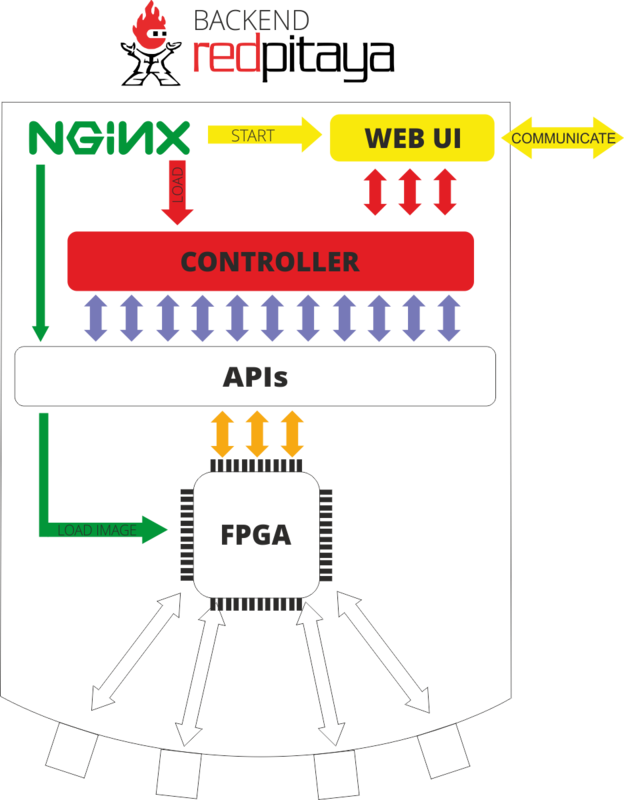 System base on Nginx as fast platform for Web applications. Nginx allows us to load modules in runtime without restarting system. Nginx always works as web server for providing Web UI.